This vintage real photo postcard features a parade on a street lined with spectators. The caption below the image states “A large coach of horsemen and their darlings”. “Charros” are traditional horsemen from the central-western regions of Mexico. The definition of “Chinas” was difficult to pinpoint. Research yielded several definitions but the one that fit best was “darlings” or “honeys”. The Kodak (Sello) stamp box on the reverse of the postcard indicates that it dates back to 1941. The postcard was published by Kodak Mexican Ltd. This vintage photo postcard is in good condition (see scans). This vintage photograph features a young couple posing for their photograph in a farm field. A tall wooden wagon is directly behind the pair. It is likely that the wagon was used to collect the crop and bring it to storage or market. The image was photographed by Foxco in the 1940’s. It was found with several photographs taken in San Antonio. The company has an interesting history. The Fox Photo Studio was opened by Arthur C. Fox in 1906 in San Antonio, Texas. After being bought by another company, it became the largest Kodak finishing firm. Ultimately, the company grew to 12,000 dealers nationwide. The photo is printed on paper thinner than stock used for cdvs or cabinet cards. The photograph measures about 3″ x 2 1/8″ and is in very good condition (see scans). This vintage real photo postcard features two adorable young children wearing carnival costumes. This postcard is a rare studio portrait by an unidentified photographer. The children are seated at a table and on the table is a set of blocks. This postcard was printed on Kodak postcard paper. A woman poses for her portrait at the Lindenmuth Studio in Allentown, Pennsylvania. She likely viewed her self as foremost, a musician. 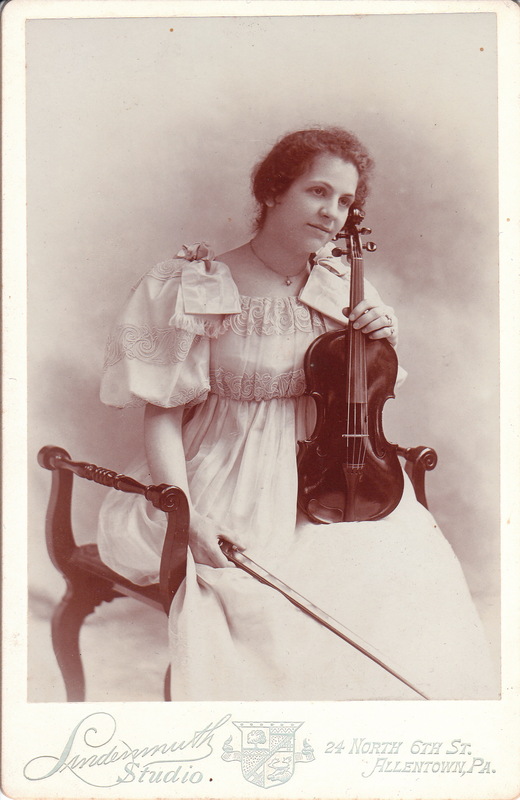 She chose to pose herself, or approved the photographers instructions, to pose sitting and holding her violin and bow. The photographer, Arlington Nelson Lindenmuth (1856-1950) is a noted American landscape and portrait painter. He worked in Allentown which is located in the Lehigh Valley area of Pennsylvania. He was a member of the Baum Circle which was a group of artists who were influenced by the work of Pennsylvania impressionist painter Walter Emerson Baum. Lindenmuth studied painting under Peter Alfred Gross and also in Europe. His paintings were exhibited in Philadelphia and New York City. He also painted a number of murals which still can be seen in a number of Allentown’s buildings. Lindenmuth is also known as one of the pioneer photographers in the Lehigh Valley. He operated a photography studio in Allentown for a number of decades. Interestingly, in addition to running a photography business, Lindenmuth taught art from his photography studio. In 1882 he worked for the Eastman Kodak Company as a traveling salesman. He was a great advocate of art appreciation. He was a proponent for the Allentown Art Museum. One of his sons, Raphael Tod Lindenmuth, had much success as an artist. 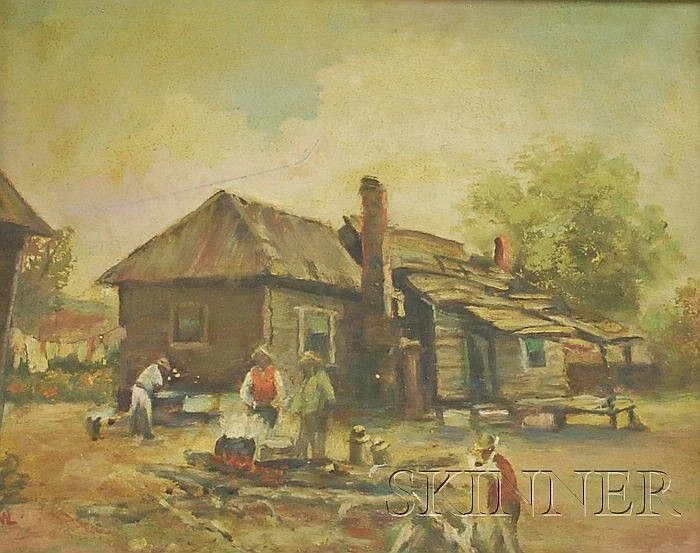 Below is an example of a painting by Arlington Nelson Lindenmuth. To view other photographs by Lindenmuth, click on the category “Photographer: Lindenmuth”. 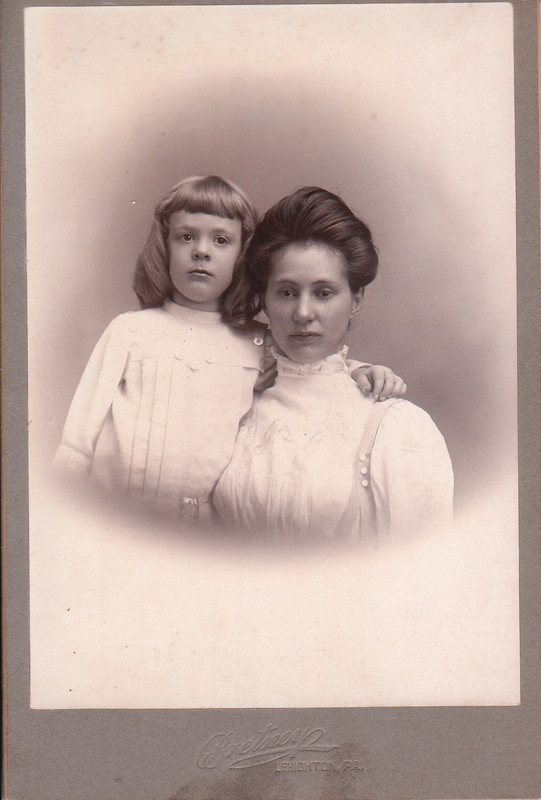 This portrait features a mother and her daughter posing at the Bretney studio in Lehighton, Pennsylvania. There appears to be some sort of emotional situation occurring during the taking of this photograph. The mother in the image seems none too pleased, while her daughter appears to be consoling her. The reverse of the photograph indicates the daughter’s name is Molly. It appears that Molly has to be strong for her mother, as her mother has suffered some sort of a loss. The History of Carbon County, Pennsylvania (1912) reports that Clement H. Bretney was the leading photographer of Lehighton. He was born in Mahoning, Pennsylvania in 1873. After leaving public school he studied art as a private pupil of H. Parker Rolfe of Philadelphia, Pennsylvania. Next he studied at Curtis-Taylor Studio in Philadelphia. He then worked with W. D. Rishel, a Lehighton photographer. Bretney bought Rishel’s studio in 1899. It is also reported that Bretney was a “dealer in Kodaks” and carried a large stock of photographic supplies. Langdon’s list of 19th and early 20th century photographers asserts that Bretney operated his studio until 1905.